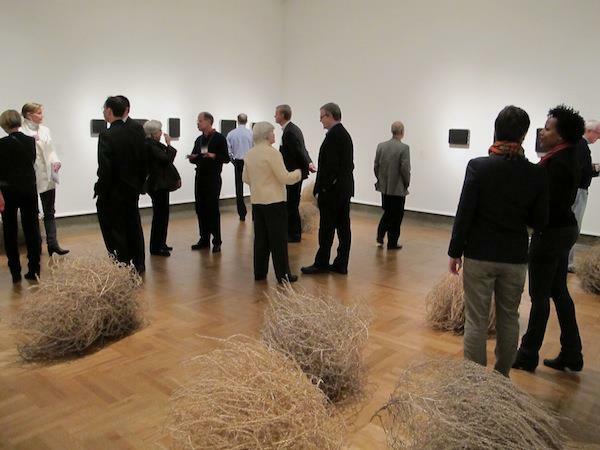 Tumbleweeds are rolling into the Columbus Museum of Art. I first spotted a beach ball-sized one juxtaposed beneath a large pop art piece by Roy Lichtenstein. Another rested below a gold-framed Monet-inspired painting. Later, I found a room filled with tumbleweeds as part of a sculptural installation by featured artist Latifa Echakhch. I’ve since learned tumbleweeds refer to at least two plants, Amaranthus albus and Salsola kali. 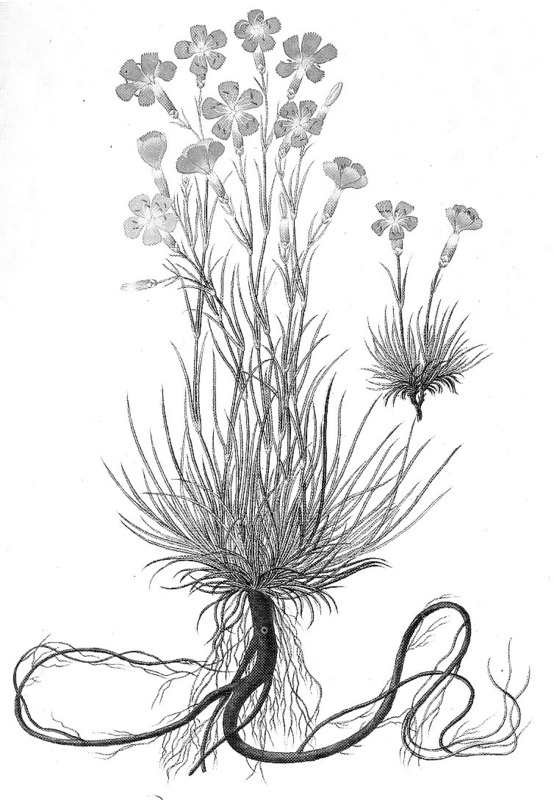 According to plant lore, the seeds of the Salsola or “Russian thistle” hitched a ride on imported grains from Russia. I was also delighted to learn tumbleweeds are commercially grown today for decoration by Prairie Tumbleweed Farm in Kansas – coincidentally the state setting for tumbleweeds at Dorothy’s home in the Wizard of Oz. Check out tumbleweeds’ other starring roles in this clever accompanying video commissioned from media artist Duncan Robson. Winter is a time for comfort food, sustaining us in this dark and cold season. This harkens back to the time when we worked outside and needed substantial meals to keep hale and hearty. While our need for lots of calories in the winter has decreased, our desire for filling, tasty food has not. Below, an offering that is full of flavor, has a protein boost and will not significantly increase your belt size – unless you eat them all at one sitting!! Preheat oven to 400°F (convection: 375°F). Lightly butter 12 muffin cups. Combine flours, baking powder, salt and cinnamon in a small bowl. In a large bowl, beat or whisk together wet ingredients. Mix well. Add dry ingredients to wet and fold just to combine. Fold in apples, raisins and walnuts. * Spoon batter into prepared pans. Muffins: bake for 20-25 minutes; mini-muffins: bake 10-12 minutes. Remove baked muffins from pan after 5-10 minutes and cool on wire racks. These muffins freeze well. *Psst! 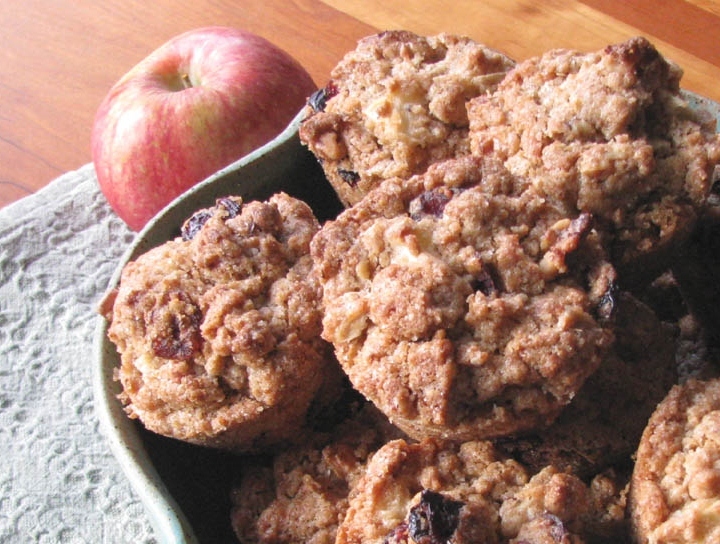 Here’s the secret to good muffins — don’t stir vigorously and over mix the batter. Instead gently fold ingredients together. 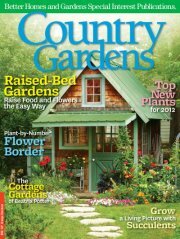 Happy 20th anniversary to Country Gardens magazine! The recent anniversary issue features six stories with Midwestern ties, including a daffodil garden in Granville, Ohio; a garden retreat in Adel, Iowa; and the Better, Homes & Gardens Test Garden in Des Moines, Iowa. P.S. –Excuse our pride, but we Heartland Gardeners are also pleased that one of our trio — Teresa — contributed two pieces to this issue. 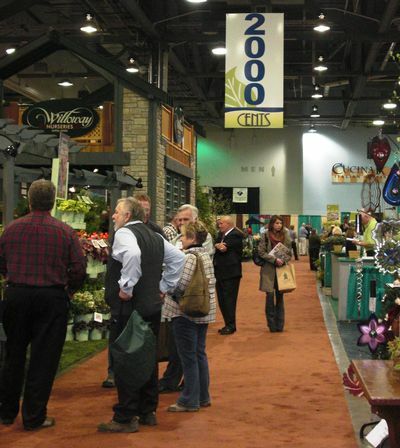 Gain a sneak peak at 2012’s newest plants and gardening trends at two of the horticulture industry’s upcoming trade shows – the Mid-Am Horticultural Trade Show at Chicago’s Navy Pier (Jan. 18-20) and the CENTS Show (Jan. 22-25) at the Greater Columbus Convention Center in central Ohio. 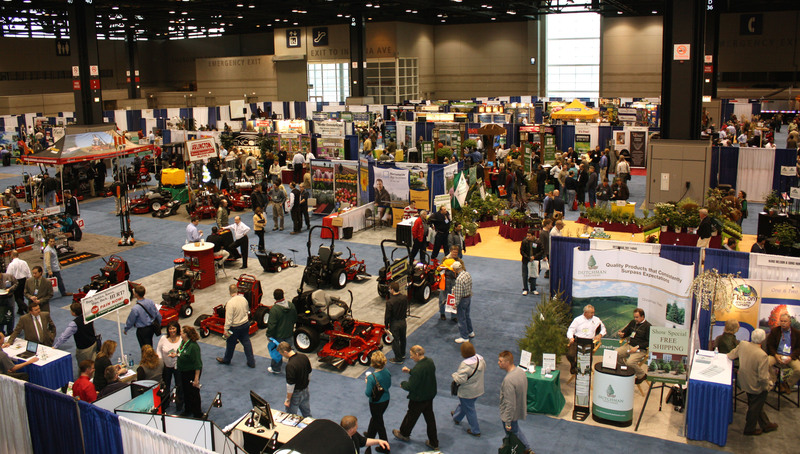 General admission one-day trade show passes are a steal at $35 for the Mid-Am and $15 for CENTS. In addition, there are a number of extra courses offered with appeal to avid gardeners as well as horticulture pros. In advance of the CENTS show, the Perennial Plant Association and Ohio State University Extension Master Gardeners will present the 16th Annual PLANT Seminar on Jan. 22. For $75, attendees gain a full day of workshops on new perennials, ornamental grasses, landscape design and container gardening. Unseen legions of microscopic helpers make gardens grow as much as an army of horticulturists — but they rarely get credit. They live in a world populated with as many varieties of life forms as the ocean, maybe more. And like the ocean, the sun only illuminates a small part of this realm. Their world connects to ours through the roots of crabgrass, redwoods and all the plants between. We call their world dirt but such a critical part of the biosphere deserves honor, if not reverence. Soil is the place where most of what a plant needs to live is found, where our gardens take root and where our feet are planted. That is why garden experts recommend amending the soil by spreading compost or well-rotted cow manure over the bed and tilling it in as a key to success. What a lot of work when all we want to do is plant lettuce seeds. Well what if the soil is the clay commonly found in central Ohio and many other Midwestern places and planted “as is”? The site will dry to adobe a few days after we water in our lettuce seeds and begin looking at salad recipes. I can’t count how many times I’m asked, “What is wrong with my houseplant?” I counter with a series of questions to try and diagnose the problem. Usually the problem starts with not knowing how a particular plant should be grown, not recognizing early signs of problems, or — horrors — the grower doesn’t know what the plant is. 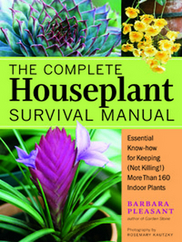 Enter The Complete Houseplant Survival Manual, which starts with plant-specific information and finishes with general information on the care of houseplants. The range of plant species and hybrids is well matched with what is available at garden centers. A handy key assists you in identifying the plant you bought in case you have misplaced the tag or there wasn’t one to begin with. Each plant profile contains pictures that are clear and eye-catching — many are luscious. You’ll learn a lot about the plant you have decided to harbor in your home: background information, specific light, fertilizer and watering needs, and most importantly, what to do when leaves yellow, spots and bugs appear or the entire plant droops. The troubleshooting guidelines and remedies alone are worth the price of the book! If you can’t keep a houseplant alive, don’t wait to ask me. Check out this comprehensive houseplant guide. • Super Bowl Street – Debuting during Super Bowl XLVI, a three block stretch in downtown Indianapolis has been overhauled into a ‘green street’ trading two traffic lines for a central median complete with plantings, kiosks, street furniture, a sophisticated stormwater system and climate control panels. • Chicago rooftops – The birthplace of the skyscraper is now home to over 200 green roofs, covering 2.5 million square feet, more than any other U.S. city. They sit atop Mayor Daley’s City Hall, Target, the Apple store, and even a McDonalds. • Community Gardens – The growing number of community gardens nationally can thank conferences in Chicago and St. Louis for the founding of American Association of Community Gardens, based today in Columbus, Ohio. • Kansas City rain gardens – The city’s 10,000 Rain Gardens initiative is recruiting homeowners to plant rain gardens and educating thousands on the benefits of reducing stormwater runoff. 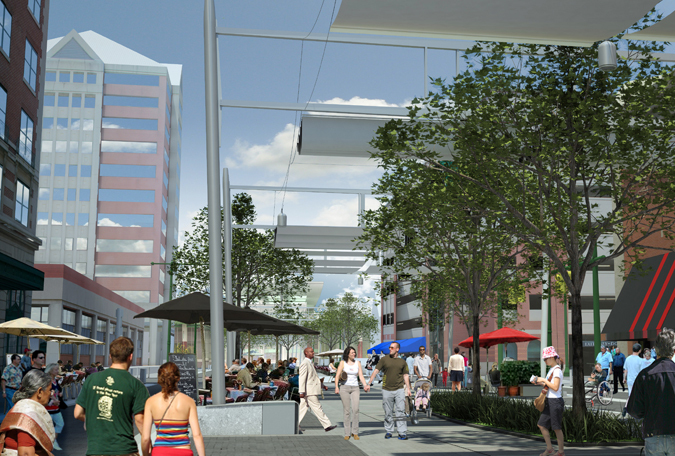 • Sustainable Sites Initiative – The Midwest is home to an impressive 21 of 34 pilot programs for this powerhouse effort in sustainable landscape design. Fellow heartland gardeners, keep up your sustainable gardening in 2012 and check out the Cleveland Botanical Garden’s seventh annual sustainability symposium, “Eat Your Yard” on Feb. 4. A tropical escape from the cold and slush of Midwestern winter comes with an admission ticket not a boarding pass. 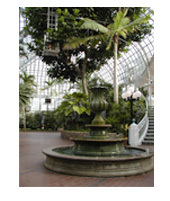 Summer awaits in glass house gardens, those amazing conservatories from Pittsburgh to Milwaukee to St. Louis. Some of these are new structures, others historic community icons. All reward with welcome warmth and a breath of fresh air — sometimes perfumed with tropical flowers. Not all escape locations are as strictly botanical as these venues. Palm-filled atriums in office buildings, hotels and shopping malls provide a dose of warmth and chlorophyll, frequently accented with splashing water that refreshes winter weary souls. Other escape hatches are large garden centers. Their houseplant sections afford not only summery warmth and humidity — but souvenirs to brighten windowsills at home. In the next few weeks we’ll highlight special conservatory events, such as the Orchids! Vibrant Victoriana (Jan. 14 through April 8, 2012) at Franklin Park Conservatory in Ohio’s capital Columbus. The show blends works by glass artist Debora Moore with the flora. Please tell us about your favorite wintering spots. This time of year is light on fresh produce grown in the Midwest. * Traditionally, we have canned, dried, frozen or stored the bounty from the fall harvest. Pickles, preserves, dried fruits and vegetables were the mainstays of the winter diet before grocery stores offered out-of-season food. What remains of our stored food is squash, potatoes and apples. Below is a recipe that uses butternut squash and apples along with a Midwest favorite: maple syrup. Enjoy! *Check out your local Winter Farmer’s Markets. More farmers are growing cold tolerant vegetables and fruits in low-tunnel greenhouses and cold frames. Also, look for hydroponically grown food. It’s a growing trend. Preheat oven to 400°F. Butter 13 x 9 x 2-inch glass baking dish. Stir butter, maple syrup and apple cider in small saucepan over medium-low heat until butter melts. Increase heat and boil until mixture is slightly reduced, about 5 minutes. Remove from heat; whisk in cinnamon, allspice and salt. 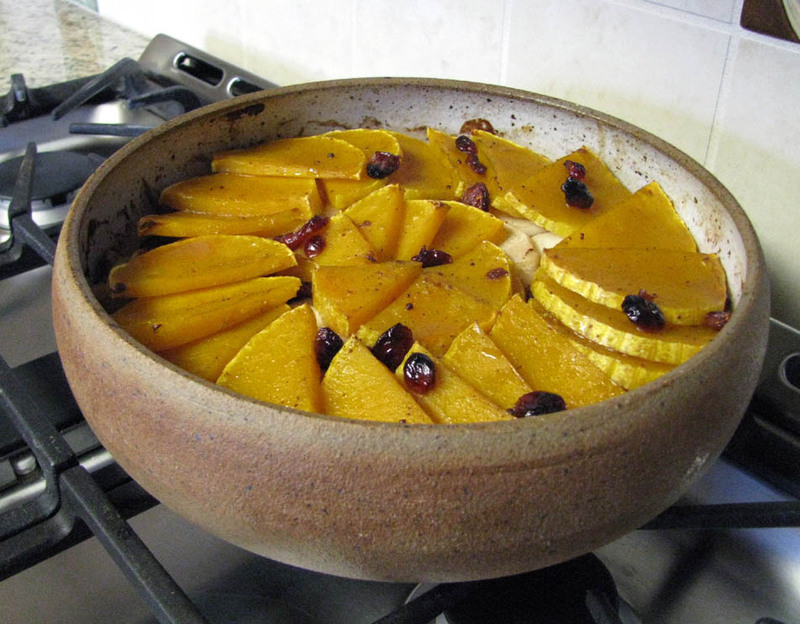 Layer the squash and apple slices: Arrange 1/3 of squash slices in prepared dish. Top with half of apple slices, 1/3 of squash slices, the remaining apples and finally the last third of the squash slices. Scatter the cranberries or raisins as desired in the layers of the casserole. Sprinkle lightly with salt and pepper. Pour maple syrup mixture over. Cover baking dish tightly with foil. Bake casserole until squash is almost tender, about 40- 50 minutes. Uncover and bake until squash is tender, basting occasionally with syrup, about 20 minutes longer. Spoon syrup from dish over vegetables and serve.